Seaside Book Nook: Literary Giveaway Blog Hop! Thanks to Leeswammes for hosting another great Literary Giveaway Blog Hop!!! There are lots of other bloggers participating in the hop (see the links below). My Giveaway.....A book of your choice up to $15 (book or e-book). Just complete the form below to entry. Good Luck! One book that I love to recommend to everyone is A Wrinkle in Time by Madeleine L'Engle. Its one of my all-time favorite books. Hmm........I don't know. Little Women was one of my favorites. I would recommend GAME OF THRONES by George RR Martin. It is brilliant. I would recommend Hearts and Minds by Amanda Craig. I'm reading a book by a friend of mine right now Stephen Zimmer. It's good so I'd recommend checking out his work. There are so many good books out there but I would recommend anything by Maggie O'Farrell especially The Hand That First Held Mine. I'd probably recommend Room by Emma Donoghue. I loved The Rose Garden By Susan Kearsley. A great read. Lawrence Durrell's The Alexandria Quartet, would be mine. I just finished The Other City by Michal Ajvaz, and it was awesome. I'd definitely recommend it. Picture of Dorian Gray by Oscar Wild was fascinating! If you haven't read The Giver, you should. It's been out for a while, but I really like On the Corner of Bitter and Sweet. I recommend 'The Dog Who Danced" by Susan Wilson. This one will tear at your heart. Lagan Love by Peter Murphy....a story of Ireland. I'm recommending The Starlite Drive-in by Marjorie Reynolds, a really nice book of 1950s America. Thanks for the great giveaway! One book that I would recommed is Divergent by Veronica Roth, it is Amazing! thanks for the offer of ANY book. That's the best kind of offer. I liked you on Facebook and became an email follower. Grapes of Wrath by John Steinback is one of my favorites! I just read Edenbrooke and LOVED it! I would recommend Little Women. The Hunger Games, for sure. I thought it was much too hyped, but turns out it is awesome!!! I would recommend any of Agatha Cristie's books. I've been recommending Stephen King's new book 11/22/63 to anyone who will listen. Thank you for this great giveaway. I'm thinking about the books Rules of Civility or The Language of Flowers. Everyone should read "To Kill A Mockingbird"
I would recommend Sarah's Key, it was a fantastic novel. Check out The Great Lenore by J.M. Tohline -- a beautiful, haunting and absolutely stunning read! Oh my, my amazon list is pages long; maybe we could make a dent in it. I'd recommend Pillars of the Earth by Ken Follett. I loved Purple Hibiscus and Half a Yellow Sun by Adichie. I would recommend Retribution Falls by Chris Wooding. I'd recommend Dark Life by Kat Falls! I highly recommend a Tale of Two Cities! I have added 2 books to my to-read-list after reading reviews on them and they are as follows: Holding On To Heaven by Keta Diablo and The Dressmaker by Kate Alcott. 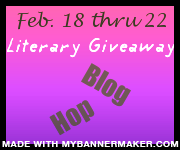 Thanks for participating in the Literary Giveaway Blog Hop! I'm an avid reader, book reviewer, and book blogger, too. Mmmm...let's see. a book recommendation? Have you read, "The Glass Boys" by Nicole Lundrigan? It's excellent and underrated. I would recommend Gone With The Wind. Lately I have read great books and more precisely "Florence and Giles"by John Harding that I recommend to you ! You should all read Maps for Lost Lovers by Nadeem Aslam; it's so beautiful! I'd recommend Gödel, Escher, Bach by Douglas Hofstadter. I always recommend The Book Thief. So good! The Goose Girl series by Shannon Hale is absolutely darling! Skipping A Beat by Sarah Pekkanen or The Dogs of Babel by Carolyn Parkhurts. Both are amazing! I have just finished Before I Go To Sleep by S. J. Watson and I would recommend this book! I would recommend any story by Stephen King. I just read Home Front by Kristin Hannah and it was amazing! The Witch of Blackbird Pond is fantastic!